The common lizard, Ireland’s only reptile, can often be seen sunning itself on dry stone walls, rocks or logs during the summer months. These animals occupy a range of habitats, including woodland, marshes, heath, moors, bogs, sand-dunes and even rubbish dumps. Common lizards are usually between 10cm and 16cm (4 inches and 6 inches) long, although larger specimens can reach 18cm (7 inches). They have long bodies, short legs and a long, tapering tail. The coarse, dry scales on the lizard’s back can be a variety of colours including grey, brown, copper or green, with a black stripe running down the centre of the back, and a scattering of black spots over the body. Male lizards have orange-yellow bellies with black spots, while females have creamy white bellies usually without spots. Lizards can typically be found basking on sunny days in the morning or the afternoon, but not generally during the middle of the day, when they are in danger of overheating. After cooling overnight, a lizard needs to increase its body temperature to somewhere in the region of 30 degrees Celsius (86 degrees Fahrenheit) before it can hunt effectively. They eat insects, spiders, slugs, snails and earthworms: pouncing on their prey and stunning it by shaking before swallowing it whole. Because they rely on the sun’s heat to remain active, lizards are forced to hibernate through the Irish winter. They disappear around October and hibernate until the following March, often in groups, occasionally emerging during warmer spells. After coming out of hibernation in spring male lizards establish a breeding territory and defend it vigorously against other males. Breeding takes place from March to May. Common lizards are viviparous, which means that the young develop within egg membranes inside the female’s body. After about three months the female lizard will give birth to live, fully developed young that break free of the egg-membranes usually during birth or a few seconds afterwards. Litters consist of 2-12 young born from June to September. Females show no parental care: the young feed actively from birth and quickly disperse. Lizards can be eaten by larger predators, but as they are active only during the day they rarely encounter nocturnal threats like foxes and badgers. They are taken by birds of prey (they typically form part of the kestrel’s diet), and stoats and mink will kill them if they can catch them. Domestic cats pose a real problem for lizards, especially early in the day before they reach full operating temperature. When they are cold the reptiles are sluggish and are easy prey for an inquisitive feline. I live in south Florida, USA. It’s like Jurassic Park here. Wish I could see an Irish lizard though. Found 1 lizard inside the house yesterday about 4pm, all curled up in a corner. Ardfield in West Cork. Lizard strolled into our house today at lunch time. My 11 year son Dara well impressed. Iv never seen one before and im living on this area a long time. Ballyheigue co. kerry. Found a male lizard today under timber logs I’m splitting up.he played dead as its not cold its actually very warm.going to show him to my grand child then let him out in a safe spot.Oldcastle co Meath. I let the dog out this evening in the dark with a torch, spotted a tiny baby lizzard on a concrete edge of our shed. Very cute! I have been living here for 20 years, first time spotting one. This is in Roundwood, co Wicklow. Will be looking out for adult ones. Quite probably Darren, although I’m afraid I couldn’t tell you where. It’s a fair old trek from the West Cork coast ;-). Ask around locally — I’m sure someone who’s into their wildlife will be able to give you a few pointers. A lizard came into our house but it was black, not light colored like in the photo. Lisheen, Kilkee, Co. Clare. Hi just found a lizard tonight on the road in Four Mile House Roscommon, I show it to my kids the wanted to take it to school tomorrow! Had one this morning in the house…..Co mayo. Never seen one before anywhere!! Just had my first ever sighting of a lizard in Limerick today (previously saw one in W Cork). It was in walking across my kitchen floor. Dog sniffed it and left it alone but he looked like it was dying. Put it outside. Saw a small black lizard last night. He was in an outside porch under the light. Cahore, Co. Wexford. Constantly finding them here in south Leitrim around our house (an old school that was abandoned for years) at least one every few months, sometimes two or tree together. but is there any chance that in good weather they would become non-viviparous? as on one occasion I found some tiny eggs under a woodpile, they were too small to be any bird but way to big to be any kind of insect egg… well I wouldn’t want to see the insect that could lay these things! It was a few years ago now and we had had a good warm, dry, summer. Kim, they could possibly be snail eggs – Groups of small round white eggs usually underground but also under rocks and logs etc. 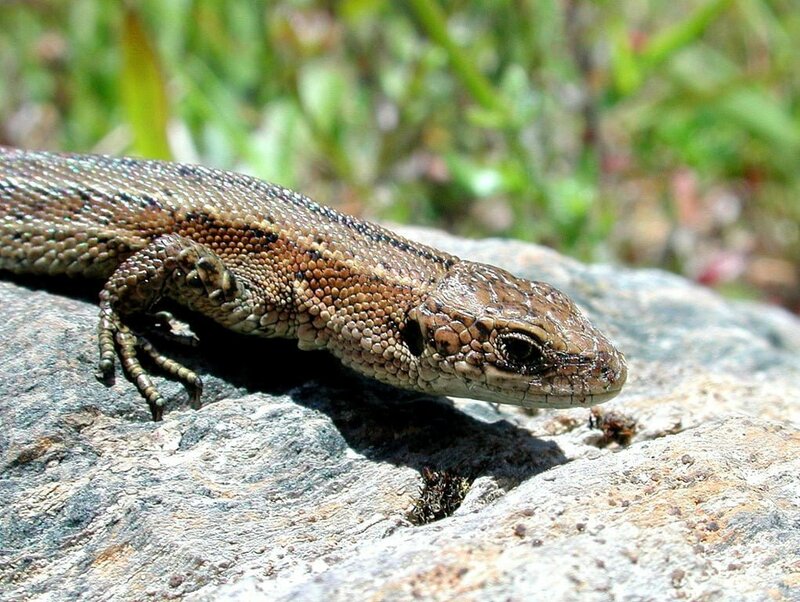 Giving birth to live young is an adaptation to survive in a cooler climate… and while common lizards / viviparous lizards do lay eggs in the extreme south of their range (southern Europe), do lay eggs Irish lizards never do. Such an extreme physiological shift is something that’s likely to have evolved over a very long period of time — rather than a direct response to short-term environmental change (a hot summer for example), so I doubt very much that your lizards in south Leitrim are laying eggs. Will mentioned snail eggs, but they’d be far too small to ever confuse with lizard eggs. Which begs the question what are they? Hiking in Wicklow Mountains (Big Sugarloaf) saw one in midday sun hidden in the gorse. Speedy fellow! Lizard strolling near the back door of our house in Daingean Offaly today. Little beauty. SUNDAY @ 11:30PM ONE OF MY CATS HAVE BROUGHT IN A YOUNG LIZARD INTO MY KITCHEN.VERY SMALL,LENGTH OF MY THUMB.GOING TO SHOW MY NEPHEW NEXT DOOR IN THE MORNING. I opened the back door to let the dog out at 22.45 and there was a common lizard. I had never seen one before and called my husband to take a look. We also called our 9 year old son who was really excited about seeing one. We live in Crusheen Co Clare on the edge of the Burren. Came home to Balla Co. Mayo and spotted a lizard parked at back door step as the drizzle came down. Night very mild but it may be “sunning” itself under sensor light. Got very close and not a movement from it, moved to different part of step when I went back shortly afterwards. Happened across one today in Moore Hall, Co. Mayo. Delighted to see it. Just found 3 in the garden under some old timber, third time to see them in the garden in the past five years, I’m near Athboy Co.Meath. Found one just inside the back door of our house yesterday, very warm out so might have been cooling down, have seen them in bogs before but never by our house. Is it ok to keep one as a pet in the right environment? No Ian, it is illegal to keep any native wild animal in captivity without a special license to do so from the National Parks and Wildlife Service. Hi, Just saw a lizard in one room downstairs of my house around 3pm, my child and I panicked as we didn’t know they did live in Ireland. I have a picture. We catch it but now we need to know where is the best place to let it go as we have a cat. Saw one years ago in the garden of our house between Ardara and Glencolmcille in West Donegal. I thought he must have arrived here in a tourist’s suitcase lol as I believed (obviously erroneously!) that there were no reptiles in Ireland. We found a baby viviporous female lizard at the back of our house today. my son decided to release it. hope it will be ok.
We have these lizards reguarly from spring to summer near Plumbridge, county Tyrone. Usally younger lizards when the cat has dragged it out and the tails are off. I’ve set up 4 flat stones around the garden to bask in, with rockeries around them that the cats cant reach into. I hope this reduces the attacks. Hi, just saw today about 3.30pm in the back garden. I was sitting out and he came right up to me and was under the chair for about 10 minutes. Lovely looking creature. first time i saw one here since we came to this area 15 years. We live in Co. Sligo. along the N17 – 2 miles on Sligo side of Tubbercurry.